We believe that everyone should know how to respond to and prepare for emergencies. That’s why the Magic Valley Y offers a range of health and safety classes that teach you new skills, keep you knowledgeable, confident and ready to respond in almost any emergency situation. 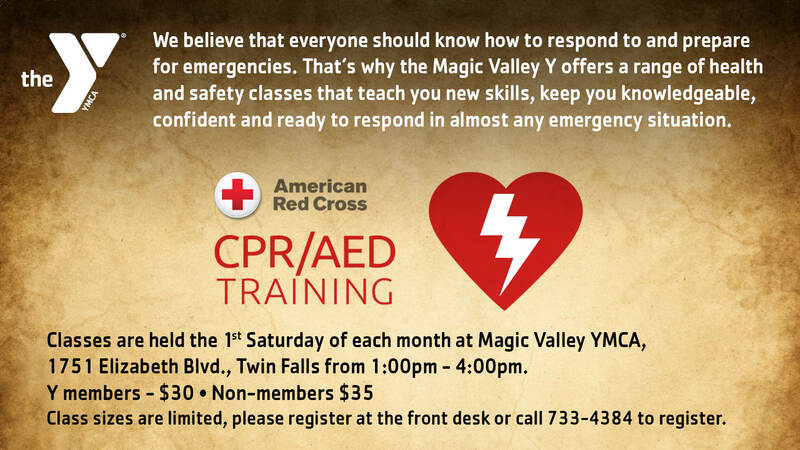 CPR - If you need training in CPR for an OSHA-mandated job requirement or you just want to know how to keep your loved ones safe, the Magic Valley Y offers American Red Cross certified courses to ensure you get training that sticks. AED - Sudden cardiac arrest can happen to anyone, at any time. With our Red Cross AED and CPR training, you can learn when – and how – to use an Automated External Defibrillator (AED). Our AED courses deliver simple-to-use techniques and information that can help you save a life. Our Red Cross CPR and AED classes include a free digital certificate, valid for 2 years, plus free access to digital learning materials and online refresher courses.